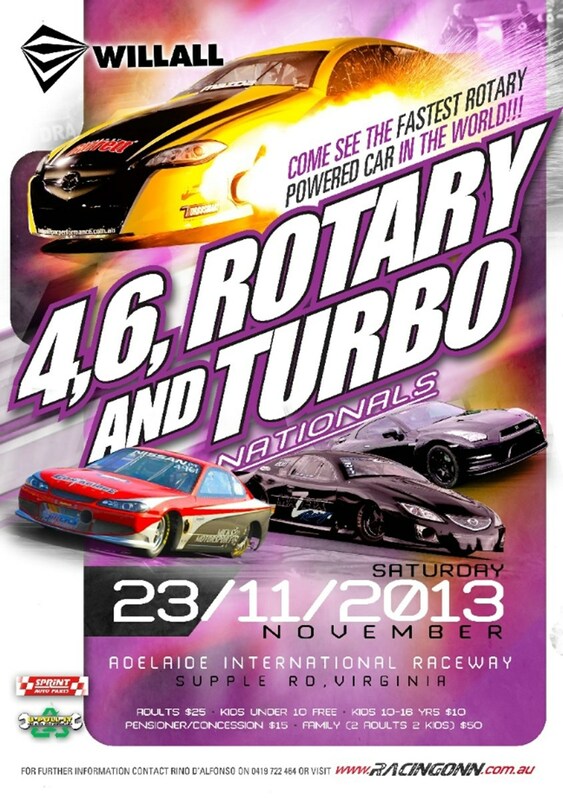 ADELAIDE 4,6,ROTARY & TURBO NATIONALS IS A GO! Since 2005 when the Pac Performance team last raced at Adelaide International Raceway we’ve been counting down the days ‘till we could once again return to the south and put on a show for our loyal fans and followers. We’ll that time has finally come! That’s right PACsters, the Pac Performance Mazda6 SP, currently the World’s Quickest & Fastest Rotary is coming to Adelaide International Raceway in November to compete at the 4,6,Rotary & Turbo Nationals. Saturday 23rd November will see the return of hard-core high-tech drag racing to Adelaide with the running of the 4,6,Rotary & Turbo Nationals event which will now also be combined with the recently confirmed VL Turbo Nationals. With names like Pac Performance, Mazfix, Micks Motorsport, Maatouks and many more on the entrant list this event is set to be HUGE so you won’t want to miss it! Stay tuned to the Pac Performance facebook page for as well as the Adelaide Int’l Raceway website for updates as the event draws closer.